Topics: Sutton United Fc, Paul Loughlin, and Business Networking Seminars. 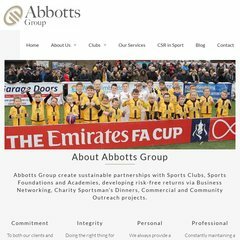 abbottsfc.co.uk Abbotts FC | Football Media Advertising Sponsorship Agency ..
PHP/5.2.4-2ubuntu5.27 is its coding language environment. Its 2 nameservers are ns59.1and1.co.uk, and ns60.1and1.co.uk. It is hosted by 1 1 Internet Ag Baden-wurttemberg, using Apache web server. PING www. (82.165.62.246) 56(84) bytes of data. A ping to the server is timed at 122 ms.